TomTom Go+ Navigator — The BEST AUTOMOTIVE GPS What we've always expected from a GPS navigation system is ability to enter a destination address as quickly and efficiently as possible and to receive clear audio and visual instructions promptly. On all counts, the TomTom GO delivers. The GO is the easiest-to-use in-car GPS system we've reviewed yet. Its mobility and relatively low price ($899.95, compared to the $1,200 price tag of the Magellan RoadMate 700) also make it a compelling alternative to factory-installed dashboard units. Housed in a curvy and relatively small case, the lightweight GO comes with a suction cup windshield mount and an adhesive bracket for on-dash installation. The lack of buttons on the GO might surprise you at first, but access to the features is provided via touch screen. With Microsoft Streets & Trips 2005 navigating the system's interface is exceptionally simple; its large, easy-to-read icons provide access to all operational features. At no point are you required to fiddle with a stylus or to weed through hard-to-find submenus. And the GO will run for 5 to 6 hours on a full battery charge, which allows you to fully disconnect from the cigarette-lighter adapter. The included CD contains the main application and street-level maps of all 50 states (state or regional level), which can be uploaded through the mini-USB port onto the 256MB SD card located on the front of the device. Getting started with the GO is a pleasure. Multiple destination routes and an extensive POI database are available, and simple A to B navigation by address is easily entered into the system. The GO first asks for the city name, then displays all matches, based on the loaded state maps. Route instructions are relayed by voice and rendered in 3D (they can also be displayed as text). The quality of GO's 3D map was far superior to any of the other finalists. The maps are a closer approximation to the driver's perspective than 2D versions and make it easy, even in dense city environments, to see upcoming turns. The zoom feature provides even more detail or, alternatively, a broader overview of the surrounding area. You can even adjust the preferences to left- or right-hand display. Switching to night mode when it's dark allows you to anticipate upcoming sharp turns in the road—a great additional safety feature. When driving under overpasses or in tunnels, the system switches on its ASN (Assisted Satellite Navigation) feature, a technology that calculates your position in the absence of a GPS signal based on information from internal position sensors. The most surprising feature, however, is the quality of the built-in speaker and voice. We could not believe at first that the little speaker on the back of the unit was producing such full-bodied sound. Inside the car you might think that "Laurie," the friendly navigator, is sitting right beside you. Our only criticism is that the screen is very receptive to glare—common to all touch screens—and can become unreadable when hit by direct sunlight. But overall, the TomTom GO is the first device to deliver ease of use, accuracy, a great display, and superior sound rolled up into one sleek package. Magellan Roadmate 700 Imagine having a personal assistant in your car, guiding you turn by turn, with a friendly voice and visual signals, even when you don't know the address. That's exactly what you get with the Magellan® RoadMate ™ 700 portable GPS Auto Navigation System. Forget about sorting through large folding paper maps or taking the time to print out Internet directions. With a built-in map database of the entire U.S. and Canada there's no need to download mapping information from your computer. Simply turn it on, select a destination using the latest in full-color, touch screen technology or the dynamic backlit keypad and within seconds you're on your way. The Magellan RoadMate 700 is built on the same technologies as the Hertz NeverLost® system. (Hertz NeverLost has been rented over 4 million times since the introduction of the system). The Magellan RoadMate 700 makes your driving adventure easier and more enjoyable. Lightweight and truly portable, the Magellan RoadMate 700 goes wherever you go, from your personal vehicle to your business car, to your RV. The Magellan RoadMate 700 has over 2 million points of interest built-in, making it easy to find your destination quickly and easily. Search by name or category for gas stations, restaurants, hotels, ATMs, sights, amusements and more, whether you’re driving cross-country or to an unfamiliar address across town. The Magellan RoadMate 700 is ready-to-go, right out of the box, putting the convenience of a personal assistant and the accuracy of vehicle navigation literally at your fingertips. Turn it on and go! Intuitive design and friendly user interface are combined with an extra large touch screen and dynamic backlit keypad for easy operation, plus a full-color screen that automatically adjusts to the light conditions for easy viewing day or night. Dynamic turn-by-turn guidance with TrueView ® 3D navigation and friendly voice prompting clearly indicates when to make your next turn. The voice prompt tells you when to turn and you can confirm the direction at a glance. There’s no need to watch the screen as you follow your route with confidence. With detailed mapping of the entire U.S. and Canada , you can travel the country with no need to download new data. A single seamless database, built-in to the hard drive, contains all major city streets as well as federal, state and county roads and highways. Lightweight and truly portable, the Magellan RoadMate 700 is easily transferred from car to car, so you can take it with you wherever you go. Its compact size and light weight enable you to easily take it with you on business trips or when you change cars. There are fifteen different topics in the built-in tutorial to help you when you really need it, when you are on the road. You can easily access the tutorial at any time to find answers about Reading the Guidance Screen, Entering an Address, Accessing Previous Destinations, Using the Trip Computer, Personalizing Settings and more. Magellan RoadMate finds your location and the map continues to move with you by tracking up to 12 GPS satellites simultaneously. Assisted by the Wide Area Augmentation System (WAAS) and the European Geostationary Navigation Overlay System (EGNOS), the Magellan RoadMate is accurate to within 3 meters or better so that you can rest assured that you know where you are and where you’re going. The comprehensive POI database provides just under 2 million listings in over 40 categories, including restaurants, gas stations, ATMs, historical monuments, parks and more! You can easily select your destination by name or category to find the nearest gas station, historical monument, rest stop, or restaurant along your route. Shortest Time – an advanced algorithm calculates your route using shortest distance and speed limit factors. Shortest Distance – determines your best route by shortest distance traveled. Least Use of Freeways – calculates your route through city and side streets enabling you to stay off the highways when possible. Most Use of Freeways – provides directions over freeways, highways and interstates. True View – shows a detailed view of actual road layout for upcoming turns and information about intersection maneuvers. Map View – super bright, high-resolution display screen with bold and easy-to read icons and text. Zoom in or out on a detailed map. Plus select from 9 different color combinations to choose your favorite. Maneuver List – details when and where to expect turns along the route. Want to avoid a certain road or maneuver? Simply press a button, the Magellan RoadMate 700 will find another route. QuickSpell intelligently sorts, searches, and checks spelling for rapid address entry with minimal keystrokes, accelerating your data entry by matching letters to the available destinations. The Magellan RoadMate 700 automatically calculates a new route when you decide to take a detour because of heavy traffic, a closed road or just to grab a cup of coffee. Store up to 100 personal or business destinations per user for a total of 300 addresses. Each user can even personally select their top three destinations to keep them handy. Provides information about your present location so you can easily direct emergency services and roadside assistance. The Magellan RoadMate 700 turns on automatically when you start your car. Just turn it on and go! Do it yourself installation is quick and easy. There is no wiring required, simply plug in the power cord and you are ready to turn it on and go. Garmin GPSMAP 276C The GPSMAP 276C is an all-in-one, versatile, color chartplotter and automobile navigator - perfect for land or water. This portable GPS navigator features a 256-color TFT display that's easy to read in bright sun along with a built-in basemap and auto routing to provide you with turn-by-turn directions to the marina for a day of boating. On water, the GPSMAP 276C is a dependable, color chartplotter with a built-in Autoroute basemap enhanced by Garmin's marine cartography. It accepts pre-programmed or user programmed data cards with MapSource® BlueChart® for offshore detail or Recreational Lakes with Fishing Hot Spots® for detail of inland lakes. In addition, the GPSMAP 276C supports external NMEA sources for water depth, water temperature, and water speed through two serial interfaces. The unit also features a new Course Deviation Indicator (CDI) - an advanced navigation tool commonly found on aircraft, but equally practical in the marine environment. The CDI quickly indicates if a boat has veered off course. On land, the GPSMAP 276C's Americas or European Autoroute basemap features interstates and major highways. With an optional automotive kit that includes MapSource City Select® software, data card, friction mount, and 12-volt power adapter with speaker, drivers can receive voice-prompted turn-by-turn directions to addresses and points of interest throughout the United States and Canada or Europe. For map transfer or software updates, the GPSMAP 276C features a fast USB-PC interface. The unit is also powered by a rechargeable lithium-ion battery pack, or a standard 110-volt AC plug. The use of GPS in automotive navigation is perhaps its most exciting application. Imagine a dash-mounted device that provides step-by-step driving directions, right down to the estimated travel time. Low on gas? You can use GPS to find the nearest gas station. While you're at it, you can locate your favorite fast-food restaurant for a bite to eat along the way. Automotive GPS is capable of performing these tasks, as well as driver assurance services like roadside assistance, vehicle tracking, remote diagnostics and more. Orbiting 12,000 miles above the Earth, satellites work together to determine the position of a GPS receiver. Recent innovations in GPS technology include smaller, lighter designs, better reception and longer battery life. Basic models provide reliable position and navigation information, while more advanced receivers offer PC-uploading capabilities and an integrated database of cities, highways, roads, restaurants, lodging, lakes, parks, and other points of interest. It's easy to see why GPS has created such excitement in the world of navigation. 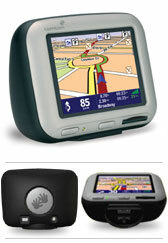 Garmin, Magellan and TomTom make gps devices of all kinds and they excel in automotive devices. We evaluated Magellan's Roadmate 700, Roadmate 500, 750NAV and 750M; Garmin's StreetPilot 2610, StreetPilot 2620, StreetPilot Color, GPSMAP 276C and GPS III Plus; and TomTom's Go+ Navigator. Any of the above units would serve a consumer well, but we wanted the best. Our three finalist's (selected by our panel of judges) for Best GPS in the automotive category are — Magellan Roadmate 700, TomTom Go+ Navigator and Garmin GPSMAP 276C. to link to our site.